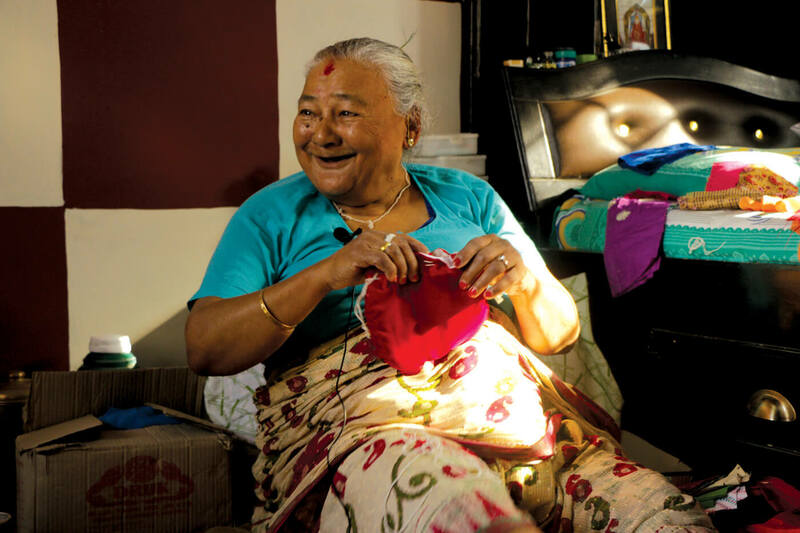 Champa Devi Tuladhar loves knitting socks so much that at 76, she wakes up at four in the morning and gets to work. Having learned the skill from her sister at age 8, she has knitted consistently throughout her life. Tuladhar’s hands are never idle, as she knits away to prepare her grandchildren for the coming winter. Lorina and Irina Sthapit grew up wearing those socks. And since they were always close to their grandmother, the sisters understood their grandmother’s love for knitting and wanted to share her socks with the world. 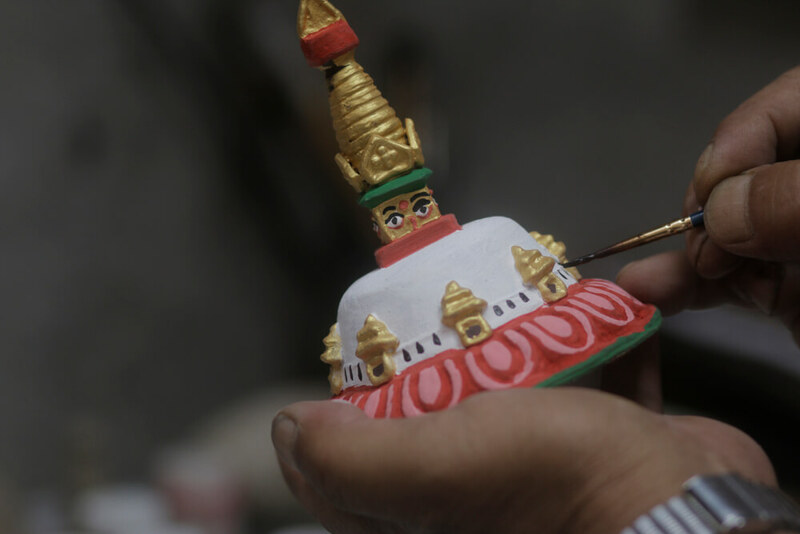 They founded Aji’s (grandmother in Newari) where six elderly makers are hard at work, creating a range of hand-made products from traditional pouches, to replicas of famous temples, bracelets and puja sets. “We were inspired by our grandmother to start with, but realised that everyone from her generation has some unique skill to offer, which is backed up by years of experience.” Lorina Sthapit said. With six makers and five more ready to start, Aji’s seeks to expand and involve more grans (there is one grandfather so far). 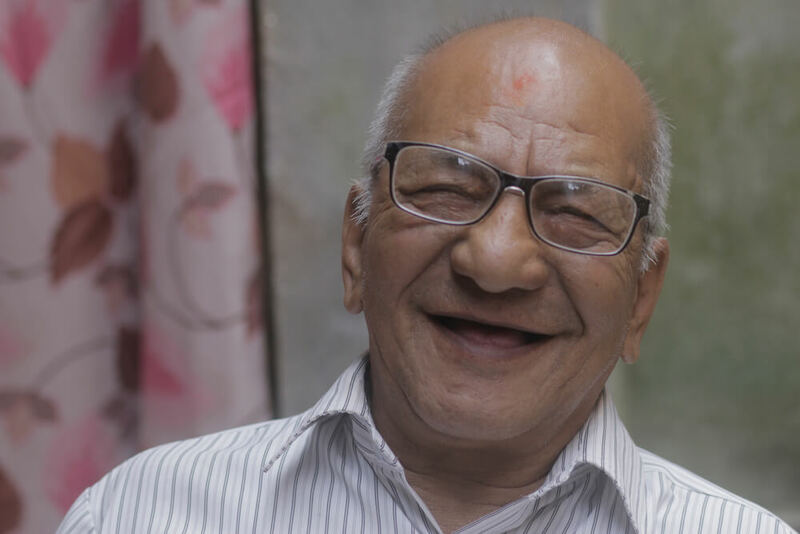 Gyani Laxmi Manadhar, 91 is the latest addition to Aji’s team, and is the most elderly member. She makes traditional Newari pouches called mheechas. She is jovial and energetic, and imaginative. “I cannot move around much, but by closing my eyes, I can get to anywhere in the world,” she says with a beaming smile. Manandhar receives scraps of discarded materials from tailoring shops, and selects the fabric to create pouches of diverse patterns and colors. She has a methodical step-by-step process. “These are my riches and my own little factory,” she says, pointing to her scissors, cloth, and the finished products. She used to make meechas as a hobby and gave them away as presents to people visiting her home. She still does not want to make money out of selling them, but will donate the income from Aji’s to charity. As the elderly are restricted in their movement, family has moved away, and there is loneliness setting in, the elderly need activities like these to root them in their communities. They feel most excited when their work is appreciated by Aji’s customers, they say they feel valued and rejuvenated. “Sitting idle makes me feel sick,” says 70-year-old Juju Ratna Tamrakar, for whom art and sculpture-making have been a life-long passion. He makes cute little stupas and dharma chakras for sale at Aji’s. Aji’s also aims to revive inter-generational bonds as joint families split up. By signing up their elders, buying materials for making the products, coordinating communication and helping to create optimal working space at home, children and grandchildren can play an active role to supporting their grannies. Champa Devi Tuladhar says she is now bonding with her grandchildren like never before. “We now actually talk about my work, and we didn’t do much of that before,” she adds. Another aspect of Aji’s is the #AskAnAji campaign which wants to preserve traditional knowledge that is endangered because they have not been passed down to younger generations. People from all over the world can send in questions about recipes, crafts, festivals, or even baby massage and get an answer quickly.